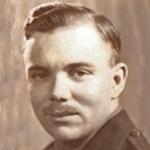 In May 1944 he was a Major attached to the HQ Special Service Group. 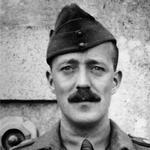 In late July 1944 Major De'Ath was posted to 45RM Commando at le Plein, France as second in command, remaining with them until November 1944 [2A]. 1. London Gazettes supp. 34796, page 1057. 2. 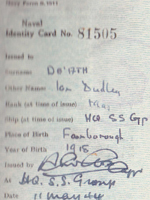 Naval Identity card no 81505 issued to Maj. De'ath 11th May 1944. 2A. Book published for those who served called The Story of 45 RM Commando. 4. London Gazettes supp. 40987, page 653.